Wowza! Here we go again. It feels like it’s been years since we gave you vegetables. It’s time now, we’re ready to do feed you fresh yummy veggies! It’s simply been a nice spring so far, on this little farm. One farmer friend put it well: after what we’ve gotten used to the last couple years (long, wet and cold), this spring is a joy. Moderate temperatures plus regular gentle, moderate rains, and low insect and plant disease pressure. We’ve had just enough dry hours between rains to comfortably get in the fields, to till or add compost or minerals, plant, cultivate some weeds and then plant some more. The soil is mellow, loose, soft, a farmer’s dream. The work has been the same, even amidst the hustle. Fair weather, healthy loose soil and an awesome farm crew. Life is good. If you’ve driven by you may have noticed — this place is still a construction zone. We’ve been adding on to the barn to make the new root “cellar” / storage facility. Like many building projects, especially additions it seems, it is going well beyond schedule. After being frozen out of digging by the early winter last November, the foundation crew was able to get started quickly in April. Since then we’ve been framing, roofing and insulating whenever we can sneak a spare hour or day from the fields, which is less and less often now. Remember the old back door, north, behind your vegetables in the barn? That now opens into the root storage. Look through there and you’ll see the steel is partially up on the inside, starting to cover the insulation. We had hoped to be finished by now, so we could focus on enjoying the summer farming routines, but we’re settling in to having a summer farm / build routine. Life is a work in progress, and we’re settling into it. The call of the fields is strong right now — to be in the right place in the right time for those hundreds of thousands of baby plants is far and away our most important, and satisfying, farm job. When done, the new building will be used in the summer for washing veggies, but its main purpose is to bring you great winter roots, all winter long. We might opt in the future to do a winter share; for this year we’ll be “open” a day or two a month in the winter for anyone to come to the farm to buy what they’d like to have. We expect to sell carrots and other roots wholesale all winter too, to St Olaf, Carleton, Just Food, Ferndale Market, and our exciting new partner, the Minneapolis Public Schools. We’re working on growing our relationship with the Northfield Public Schools too, and a few others. It’s an exciting thing — an abundance of local, organic, super sweet carrots and other roots all winter long. It’s a time of moving forward here and we’re having a good time enjoying the ride. We hope you enjoy the first fresh beautiful harvest, and all the ones to come!!!!! This year the scallions are a little small, the radishes and turnips might be a little big, overall it’s looking like a beautiful harvest. 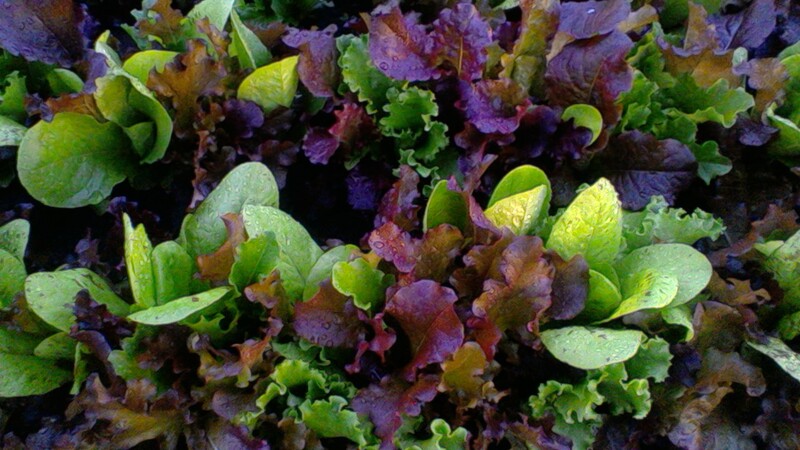 The spinach is the most beautiful spring spinach we’ve had in years, and the leaf lettuce is right there too. Our favorites in the kitchen this past week have been spinach and spring garlic. The spinach leaves are big and tender and mild, they fit perfect in a sandwich. Or cut into strips and sauteed with whatever else is in the pan — cooked greens just add that special something to a dish. Be warned — Spring spinach has no chance at being as sweet as our fall spinach 🙂 It takes hard frosts to make that melt in your mouth (not your hand!) sugar, and we kinda like that there’s usually no such thing in spring. 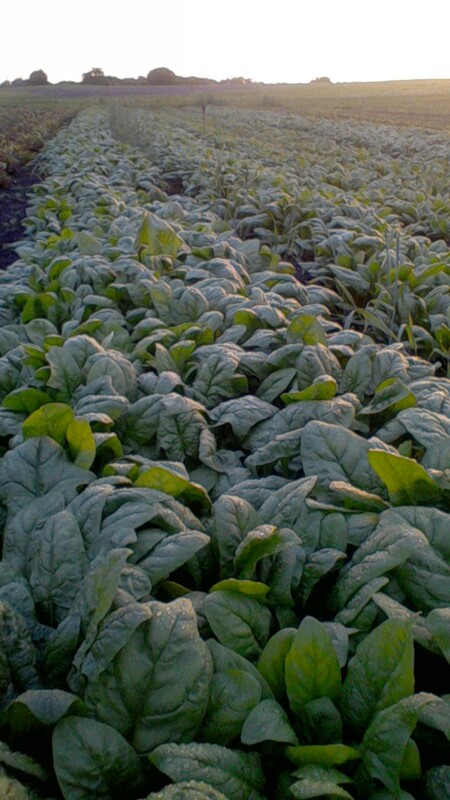 Think of this spinach as a different food — tender, mild, nourishing, your welcome back to farm fresh vitality. We’ll have it 1-3 more weeks, it looks great now but it doesn’t like heat. With enough sun and warmth strawberries should start coming in about two weeks. Peas are along the driveway — look for them when you drive in — they’re doing well but they have a lot of growing to do! (Check the U-pick board each time you come to pick up your share for availability and picking amounts per share.) After a few weeks of salad, sandwich and stir-fry fixings, we’ll start having beets, carrots, broccoli, summer squash, cucumbers, and cabbage. Right now those crops look aeons away, but fortunately plants move fast at solstice time. Sometime in later July the tomatoes start trickling in, along with peppers and eggplant. By August we hope to be swimming in the unbeatable mix of juicy and delicious warm-weather fruits and veggies. We often wish it would start right now, but spring and early summer eating is simply lighter and just as luscious! Strawberries could be ready in a week or two, everything else is soaking up the sun and on its way. The strawberry plants are loaded with flowers and green fruits, even the ones that are surrounded by dandelions! Next week we’ll have cilantro, mint and lemon balm. This spot in the newsletter will keep you informed, and always check the U-pick board when you’re here to see what’s available and picking amounts. A special welcome to new members We’re so glad to have you on board! If you have questions about how the share works, please ask one of us. It’s your farm—please visit anytime. Get to know and enjoy the farm. Check in on the crops as they grow, walk the path down by the honey bees, or feed the chickens some grass through the fence. We have a new sandbox opposite the barn door — sand is coming soon! If one of us is in the fields, we might not be able to stop and talk, but you are always welcome. Food Shelf Donations With your support of the farm, each year we are able to donate 4-5,000 pounds of fresh produce to the Northfield Food Shelf. These veggies are simply the leftovers from the share pickups, the same fresh, high quality food that you get in your share. With the help of a few very dedicated volunteer drivers, it gets delivered to the food shelf the next day. So if at any time you do not want to take all that is yours in the share pickup, you can leave it and it will go to the food shelf to help feed those in need, an unfortunately growing number of people in our community. Separate from these donations we also are pleased to sell produce to The Food Group, through their unique Harvest for the Hungry program. Each year we participate we like this program more. We look forward to being able to continue supplying more great food into the hunger relief supply chain for the metro area. It is a solid win-win. Harvest for the Hungry purchases from local farms are all funded by donations, if you are so inclined your donation makes a direct difference for both local farmers and folks who struggle to put meals on the table. Save the Date June 27th — our 10th Year Bash! View the evite for details and RSVP there, or to us in person. All are welcome. We hope you can make it! Please Drive Carefully —Children are everywhere. On the note of children, please know where yours are at all times. ESPECIALLY Please make sure they don’t go near the wood piles near the house. They could topple and be very dangerous. AND All buildings, except the shareroom area of the barn, are off-limits to children. This includes the new building / root cellar, and the tractor “greenhouse” (though it looks like fun in there!) T here are sharp tools in many places, of all shapes and sizes. Also stay a good distance from the beehives so they don’t think you’re a bear. If you don’t bother the bees they won’t bother you. This spring there are also building materials to avoid — mostly long white steel panels. These are both sharp and fragile — kids need to stay away from and off of them. We will try to mark or fence it off but please keep your children away from the white steel panels. Sprinkle a heavy baking sheet with cornmeal. In a food processor, blend 1/2 cup whole milk ricotta, 2 crushed garlic cloves, 1 tsp salt, and 1/4 tsp pepper until smooth.Add 2 cups shredded smoked mozzarella and 1 cup packed arugula. Pulse until just combined but still chunky. On a lightly floured surface, roll out one 1 lb ball of pizza dough, 1/4 to 1/8 inches thick. Transfer to the baking sheet and drizzle with olive oil. Spread the ricotta mixture on the top, leaving a one inch border. Arrange 2 plum tomatoes, sliced 1/4 inch thick, on top and drizzled with more olive oil. Bake for 15 to 16 minutes, until the crust is golden.